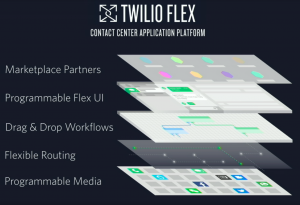 Twilio unveiled Flex, its new call center product yesterday and it definitely lived up to the anticipation that has been building since the rumors started last month. Our two stories on it Twilio Shakes Up the Cloud Call Center World with Flex and The Twilio / Amazon ‘Stack’ Will Dominate the Next Call Center Era broke our traffic records, so we knew the interest level was red hot. The big question we talked about in those posts was whether Flex would be a “formal” cloud call center offering, with per-agent / per-month pricing or some kind of upgrade to its existing call center related APIs. Turns out it’s neither. 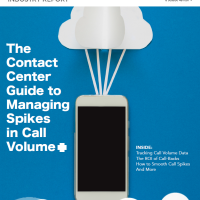 It’s something new: a call center platform. Fascinating. 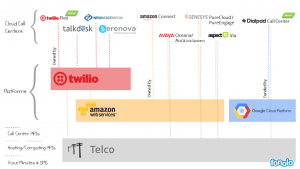 The lowest layer is Twilio’s existing API-driven communication system. 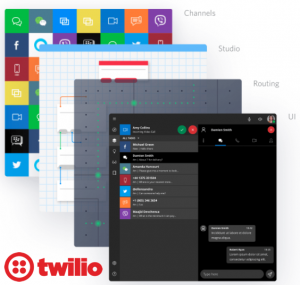 The second layer is an existing Twilio product called “Task Router”, which provides the core functionality of a call center. They talk about it as a general purpose engine to send requests (incoming calls, texts, service tickets, etc.) to resources (an agent, a bot, etc.). An old-school call center would call this an ACD (Automatic Call Distributor). The third layer is “Studio”, Twilio’s drag-and-drop GUI for building flows, which was announced earlier this year. Here’s a neat video for you to check out. The fourth layer is the first new thing announced last night: a programmable UI. This allows you to design the desktop that the call center agents and managers will see. Product lead Al Cook did a lengthy demonstration of this UI last night. Both Al and Jeff emphasized several times that you get “pixel level control” and “absolutely everything” is customizable, in contrast to the other systems where your customizations are limited to “just a corner” or “just a widget”. It’s true that every other call center system has an out-of-the-box agent desktop and manager desktop and usually you can make adjustments from there. But, I’m not sure how many call center users see that as a bug rather than a feature. I’m wondering if that messaging is aimed more at companies that want to build and resell call centers with Flex, rather than end-users of Flex. The fifth layer is also new: a marketplace of partners building on top of and with Flex. That fifth layer is really interesting. Let’s look at it section by section. The “Technology” section is also not that surprising. Twitter, Kik, Line, WeChat = messaging platforms used as customer service channels. Whitepages and NextCaller = ways to pull in caller ID and other information, so that you can present context to the agent. VoiceBase and Watson = call transcription. It’s an impressive list, but not that surprising. The “CC-as-a-Service” box is the interesting one. Serenova and NewVoiceMedia appear logically at the top. 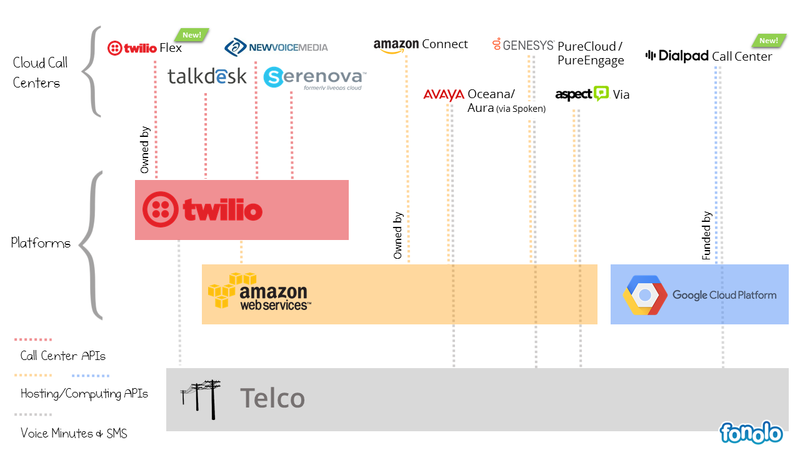 These are CCaaS (Contact Center as a Service) products, built on Twilio, which we included in our industry map two weeks ago (See below). But where’s Talkdesk? Maybe they didn’t want to be included? 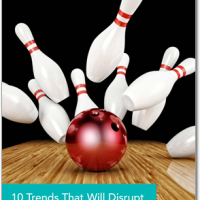 RingDNA, Velocify, SalesLoft and CallRail all focus on streamlining outbound sales calls. Not strictly “call center”, but it’s not as stretch to put them in the same box. I was surprised to see OneReach in there, they’ve been focussing mainly on bots. Twilio released something very compelling and innovative with Flex. 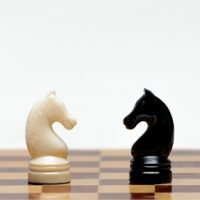 Looking back at earlier posts, this lowly blogger was perhaps narrow-minded in seeing only two options: Either Flex will be a CCaaS offering, and compete awkwardly with Twilio’s existing CCaaS customers, or it will be a “professional services” offering building bespoke call centers using existing Twilio components. I’m happy to be wrong! Actually, it’s more accurate to say I’m happy to be surprised. 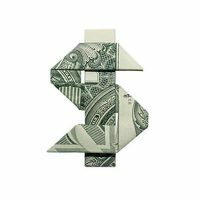 Unexpected twists and turns keep this industry exciting! 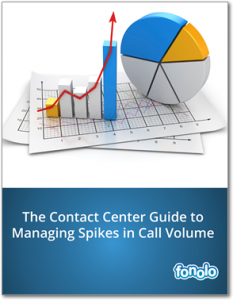 What happens when call volume gets out of control? 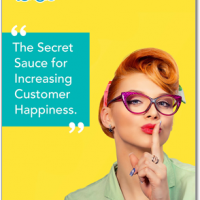 Do you have a strategy to ensure the experience doesn’t suffer? This guide will tackle those questions head on!